Yo guys, I’m just curious. How is it possible to drive through four low salary countries and spend almost 1000 bucks on food? Are you eating oysters every day? Except that, your statistics equals great info! Sven, the locals in Guatemala, Salvador, Nicaragua, and Honduras tend to eat meals comprising very cheap ingredients. They eat cornmeal and beans as their staples, and mix in pork fat and cabbage, among a few other things, to give flavor. If I were alone, I’d eat more of that kind of thing, but Sheena is particularly interested in eating healthful foods, so we tend to purchase fresh fruits, vegetables, and meats to cook ourselves. This tends to be very expensive. So yes, if you really wanted to eat cheaply, you could. Over here we eat fresh fruit from Guatemala, Salvador, Nicaragua, and Honduras too. That’s somewhat expensive. And stupid. But we do. I would go for the porky beans any day! You eat fruit from Central America, but not fresh fruit :) It takes about a month for a ship to get from Central America to Europe. Admittedly we do spend too much on food. Like I said, I’d spend a lot less if it were only me, but Sheena is pretty particular about every meal being exquisite. Your food costs seem to be pretty close to ours. Fruits and veggies are cheap if you buy them in the right place, but that can be a pain if you’re stocking up for a week. Plus meat is expensive, sometimes stupid expensive. If we counted booze as a food expense we’d probably blow you guys out of the water. Our grocery runs are usually at least 1/4 liquor. Maybe we have a problem…I dunno. Gotta go, ice in my drink is melting. Thanks Jared, nice to have another data point to compare to. We actually include our alcohol in with the food, although it isn’t very much. I usually have a beer a day, so it’s usually less than $50/month. Then again, you have 3 people to feed. Hi guys, Thanks for the monthly update! My husband & I have been following your blog for a short time now while we research our own drive down the Pan American to happen in the next 2 years. We’ve previously backpacked around the world but this time decided having our own wheels was the way to go and we’re loving following along as you do just that! Can’t wait to hear more stores of the road. I am a bit out of touch cause my last Panamerican experience was way back in 2002, but back then we used to eat and shop in the villages’ markets, fresh fruits, vegetables, and inexpensive. Has this changed?? 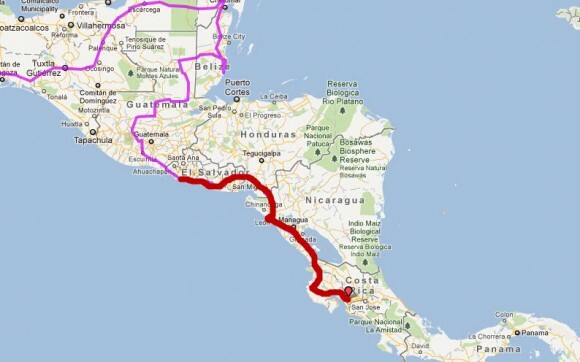 Getting ready for our third USA-Argentina overland trip, hopefully taking off later this year from NY. If you need support while in Argentina, or place to camp near Buenos Aires let me know. I spend half of the year and own a motorhome rental business there (http://www.andeanroads.com), but more importantly, I am a member of the local Westfalia group and we will be happy to welcome you! So jealous of your breakdown in Costa Rica. I have been bunkered down in California for over a month trying to get my Central American landcruiser back on the road. I bought it knowing parts would be hard to find in the states but easy to find in Latin America and I thought that would be a good compromise. What a mistake that turned out to be! Keep on truckin’. I dig your updates. As a rule of thumb, low-budget, third-world folks use meat, if at all, as flavoring, as a side dish. It’s generally a higher-cost item and, from a nutritional standpoint (and that’s not usually part of poor folks’ day-to-day knowledge) provides protein and fat at a higher life-cycle cost (i.e., it took lots of plants to produce that high-quality protein and low-quality, saturated fat). So you may consider thinking of meat as flavoring or side-dish and see what happens. A 3-oz. serving of meat (fish, whatever) is usually plenty for Homo spiens as part of a meal. And not every meal needs that. I wanted to follow up on Bob & Karen’s post about Google Voice. I have been using this to make almost all of my calls while I’m traveling internationally. It’s FREE to call any US number. You can also send/receive text messages.